The beaches are first class, the food is exceptional, the heat is unbearable but I’m British so y’know… I love the Philippines, but undoubtedly the best thing about this beautiful country is the people. Not only do they speak excellent English which you have to admit when you’re travelling makes life easier. They don’t hate tourists, in fact they seem to really quite like us; they wanna hang out, take us places and party with us. Everyone I’ve spoken to has been near exploding with love, admiration and appreciation for unique and wonderful experiences they’ve had with new Filipino friends. Their attitude to life seems near unfaltering, with this glorious optimism to cherish every moment. I’ve been hanging out with some locals at a reggae bar in Boracay. I stand out like a sore thumb, but it’s a wonderful feeling to be a million, zillion miles from home and walk into a place and be greeted by name and from friends. Soon enough a few other random, single tourists walk in and all experience the same welcome of home. I’d lost my voice from too much party party in Boracay. I said this to my new Filipino friend who just responded ,’Ah it will come back.’ Not have you been to the pharmacy? Maybe you should stay in tonight? Why? What’s happened? Just don’t worry it will come back, and it did. Surrounded by such impregnable free spirits I want their chill vibes to transcend into me forever and stay. To make a home like chill out osmosis. 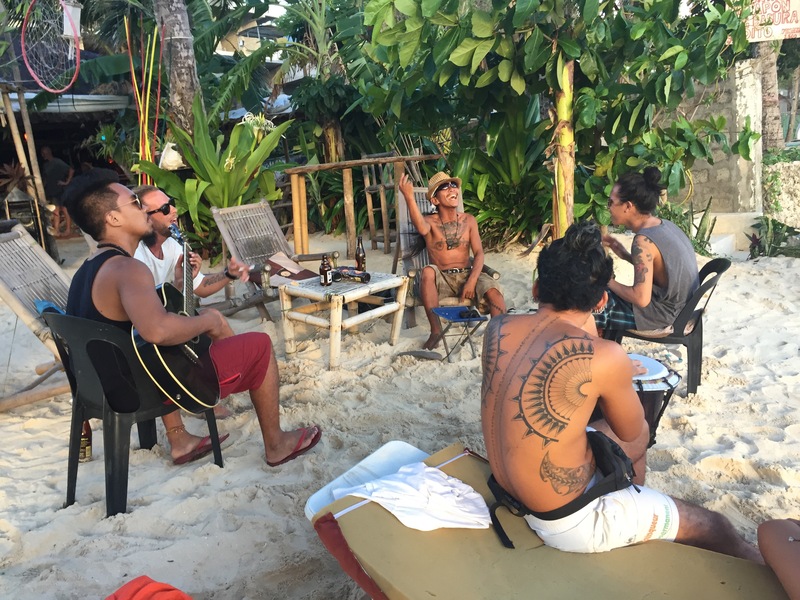 It’s easy to hope I can live their way when I’m in paradise, listening to my new friends singing along to the bongos and acoustic guitar in background. I tragically know it’s inevitable as soon as I leave the Philippines I will lose this feeling. Perhaps it’s not practical; but if it was it would be perfect. Beer. Music. White sand. Carpe diem. Being alive is a special occasion.